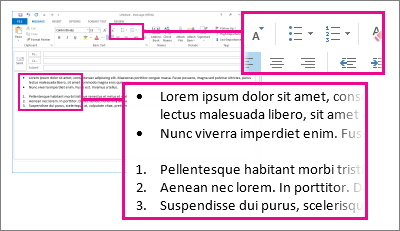 Use lists to show steps, action items, or key takeaways in your message. You can start with a new bulleted or numbered list, or convert existing paragraphs into a list. Click Message > Bullets or Numbering . Keyboard shortcut Type * (asterisk) to start a bulleted list or 1. to start a numbered list, and then press Spacebar or the Tab key. On the Message tab, in the Basic Text group, choose the Bullets or the Numbering button. Note: Outlook automatically inserts the next bullet or number. To finish the list, press Enter twice. To delete the last bullet or number in the list, press Backspace. Tips: You can use a keyboard shortcut to create a bulleted list or a numbered list. To create a bulleted list, type * (asterisk), and then press Spacebar or the Tab key. To create a numbered list, type 1., and then press Spacebar or the Tab key.